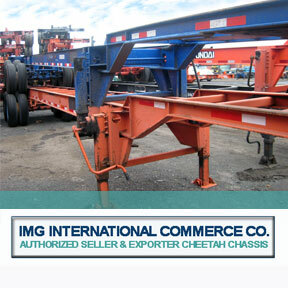 Container Chassis IMG International Commerce Co.
Intermodal and Transportation Equipment Sales. 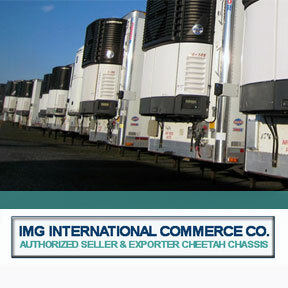 Refrigerated Trailers, axles and other Transportation Equipment. We are a wholesaler and exporter of New and Used Container Chassis. Container are trailers to haul 20’, 40’, 48’, 45’ or 53’ foot containers, we sell all kind of chassis such as 20’ foot chassis, 40’ foot chassis, extendable 20’-40’ foot chassis, extendable 40’-45’-48’-53’ foot chassis, combo 8 pins chassis, ISO tank, two axle or tri axle chassis. 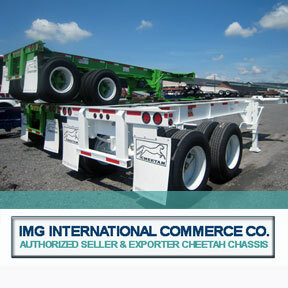 We are an Authorized Dealer for brand new chassis made by Cheetah in USA. 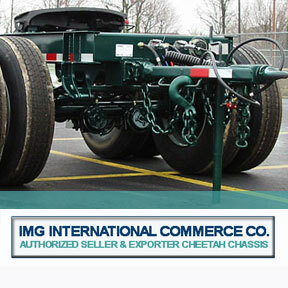 Cheetah is the biggest manufacturer of chassis in USA. We are also a Dealer for Strick Trailers (Dry Vans and Dollies) and Evans Trailers (Flatbeds and Lowboys). We sell used chassis in as is condition or refurbished condition, come from various manufactures like Strick, Cheetah, Hyundai, Monon, Stoughton, Manac, Loadcraft, Dorsey, Wabash, Bertolini, Ajax, etc. 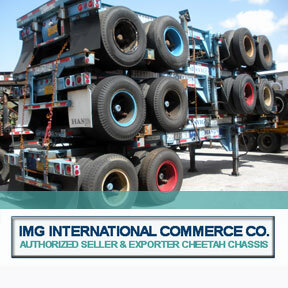 Our Inventory is not limited to container chassis, we also sell, used and new converter dollies. Used Gen sets also called gensets made by Carrier, Taylor or Thermo King. We have new and used Flatbeds, new Lowboys, new and used Dry Vans, used refrigerated trailers, used axles, used tandems and other intermodal equipment. We maintain a big inventory of container chassis and other equipment in Miami Florida also in Laredo Texas, we also carry a big inventory nationwide. We export to all countries around the world. Currently, we’re doing business with customers from Dominican Republic, Puerto Rico, Bahamas, all Caribbean Islands, Mexico, Costa Rica, Guatemala, Honduras, Nicaragua, Panama, Venezuela, Colombia, Ecuador, Peru, Chile, Bolivia, Uruguay, Paraguay, Angola, Nigeria, Cotte D’Ivory, Kenya, Russia, Canada, Cambodia, etc.